Overwhelming – to put it very mildly. Really, I can’t even begin to thank all of you enough for your generous offers to test knit. But, boy, I am so going to take you up on it. And as all the test knits come back to me over the next several weeks I will be singing their praises (the knitters and their knits) near and far. Be sure to check back, there will be some real cuties. 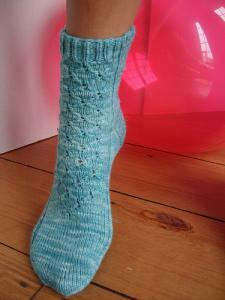 Coming Attraction – Plucky Socks! You may recall a mention of a collaboration with the ever so talented Kirsten. Well, she is putting the finishing touches on two patterns made for Plucky Yarns. I am so excited! Both of the patterns should be ready by early next week. They will be available at my etsy shop (and, once I figure out how to have them available right here on this site the patterns will also be available here) and at Kirstenâ€™s site, Through The Loops. Boy, she did a stellar job coming up with patterns that really suit the yarn. Pure design and knitterly brilliance that Kirsten. Thank you! Oooh, Oooh, Oooh! I better start saving the pennies, both are so cute! Just let us know what we need to do as test knitters!!! What fun! We get to help you out and play with some luscious yarn at the same time! The Plucky Socks are going to be such fun once they debut too! Ooh, pretty! I will definitely look forward to those patterns. Those are fantastic! I’ve really admired Kirsten’s work. the patterns really show off the yarn well too! Wow, those are really pretty socks! Now I will have the perfect pattern for my Plucky sock yarn! Can’t wait to hear when the patterns are released. 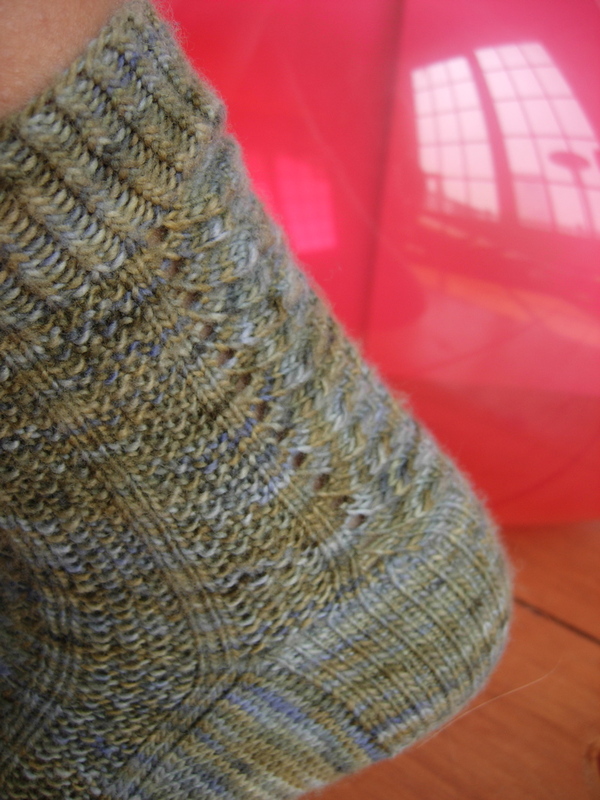 I love the way the pattern in Anne’s sock is carried halfway down the foot. They look georgeous ! Mmm, I think I must try some socks now ….. So cool! I love the direction you’re taking your business in! Was chatting with Ms. Yarn Snob the other day, and we were both gushing of how happy we are at your success. MWAH! Both the yarn and the patterns are beautiful! i’m so buying that… maybe i should just hand you my login to my paypal account. Love the blue colored sock. The sock pattern is pretty too. Miss you!